Thanksgiving is coming and you know what that means: absurd amounts of food. More food than you, me or a small third-world country could eat. It doesn’t matter how many people there are; you will make more food than you need. Last year I had a pretty small Thanksgiving celebration with just the Mom and I (the sister was far, far away in Alaska). Despite this fact our meal included turkey, ham, mashed potatoes, sweet potatoes, roasted white asparagus, green bean casserole, croissants…. oh, and five pies. Madness (to be fair, my mother does spread the love by giving food to friends and family). Why we as a society go through this ritual every year, I may never fully understand. However, I do know that I friggin’ love it (perhaps that is enough reason in itself?). Thanksgiving is a great time to reflect on all the good things in life, especially family. But that strong association with food has just been burned into our brain, and a Thanksgiving without large quantities of food would just be lacking. With the Christmas/Hanukkah/Kwanzaa/Whatever so nearby, this is the time of year people start packing on the pounds. Maybe it’s more than just the holidays, maybe it’s the fact that for most of us it’s so darn cold outside that we subconsciously pack on a little extra padding to keep us warm (I support the bear philosophy of sleeping until Spring. Alas…). However, many of us tend to feel guilty by said additional padding and go into a tizzy trying to work it off. Here’s my suggestion: eat more salad. Have a good hearty salad prior to feasting on turkey, ham, yams and god knows what else. Fill some space in that stomach of yours with something other than the traditional heavy weights of Thanksgiving – better that it’s lettuce and other vegetables than… everything else. Hell, start eating salad now. Prep yourself; maybe start shaving off a bit of weight in preparation for the inevitable gorging. 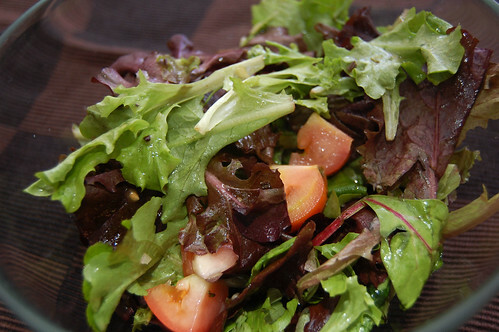 Of course a salad is only as good as its dressing. 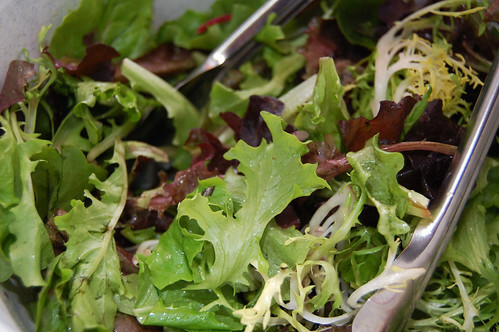 A salad without dressing is just… rabbit food. I picked up this recipe from a chef I assisted for. It’s an excellent vinaigrette with many of its ingredients readily available in most pantries. Try experimenting with different herbs – let us know what you think! This recipe makes approximately 3/4 cup of dressing, depending on how much oil you use; plenty for half a pound of greens. The amount of oil is flexible to how you like your vinaigrette and how light you’d like it to be. If you don’t have shallot then a sweet onion will work in a pinch. Combine everything but the oil in a serving bowl. Beat/whisk together briefly to ensure everything mixes together well; further crushing the garlic, onion and herbs. While whisking, slowly add your olive oil until satisfied. Spoon out a bit, maybe a third, to pour atop. Remember you can always add more but you can’t take any off. Add your greens to the bowl and lightly toss or rotate. Hi Edwin! So is this the one you made to go with your chili? The dressing sounds great! I’ll have to try it. For my potluck dinner, yes. I didn’t do the chili myself, however. It’s a tasty dressing I always find myself coming back to when I need to impress. Strong taste without overpowering. Plus, I think fresh salad greens always seem to be a great presentation.